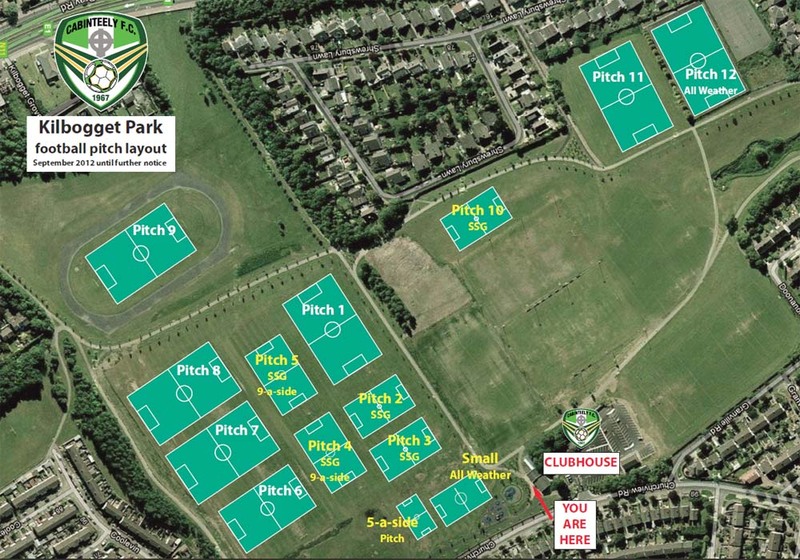 All the club’s pitches are in Kilbogget Park, where we currently have licensed access to twelve grass pitches (six each full size and small size), that we mark when required, and the full-sized all-weather pitch (no. 12). Note that we also have access to a fourteenth pitch, the small public all-weather pitch beside the playground and the clubhouse. This is used on occasion for a mini-match or warm-ups etc. Of the twelve grass pitches, six are marked for 11-a-side (nos. 1, 6, 7, 8, 9 and 11) and have fixed goalposts. Pitches 4 and 5 are dedicated 9-a-side pitches, while pitches 2, 3 and 10 are dedicated 7-a-side ones. 5-a-side games may be played on the small grass pitch beside the play area. The Saturday Cubs, Kittens, Cougars and Pumas School of Excellence is now permanently located on the all-weather pitch, no. 12. If you notice any unfamiliar teams using the pitches, do please advise Pat. If you have any pitch-related query or need to use one outside of our scheduled fixtures, please check with Pat by text ONLY on his number above and book it with the club Admin team at 01-235 4343 or by email at office@cabinteelyfc.ie.